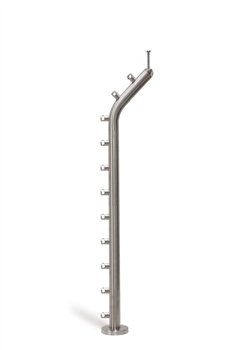 This INOX Curved Newel Post has a stainless steel design, 11 built in round bar supports for a 1/2" bar diameter, and a pivotable guard rail mount. Pivotable Stainless Steel Pivotable Connector for 1/2" Dia. Bar Stainless Steel Bar Holder 13/32" Dia. Hole for 1 2/3" Tube Stainless Steel 1 2/3" Newel Post Wall Mount and Pivotable Handrail Support Stainless Steel End Cap Henispherical for Tube 1 1/3" Dia. Stainless Steel Bar Holder 1/2" Dia. Hole for 1 2/3" Tube Flat Bar Stainless Steel Newel Post For (4) Round Bars 5/16" Dia. w/ Pivotable Basement. Stainless Steel Anchorage for 1 2/3" diameter tube Stainless Steel Round Bar 5/16" Dia. x 9' 10"